This tiny foliose lichen belongs to a group of rosette-forming limestone lichens including Collema fragile, Leptogium massiliense and Placynthium subradiatum that often occur together in the same habitat, forming tiny (mostly <1cm diam.) circular colonies. 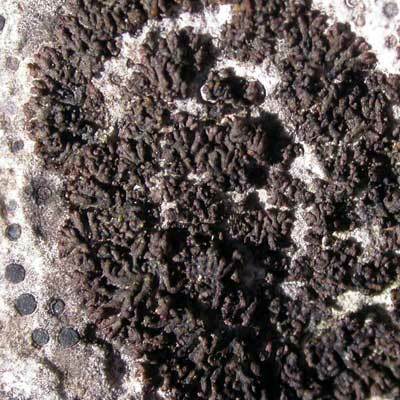 L. diffractum has narrow, radiating, brown-black, finely divided convex lobes that form firmly attached rosettes often with large parts of the centre missing so growth is only at the edges. The growing tips are never cat’s paw-like or nodulose or in semi-circular rings. On hard, damp limestone, especially at the base of outcrops; frequent in the Burren. Centres when young granular, falling out later. Simms, M. J., (2016). Leptogium diffractum Kremp.ex Körb.. [In] LichenIreland.